IMG_2553, a photo by atvtnv on Flickr. Happy New Year! 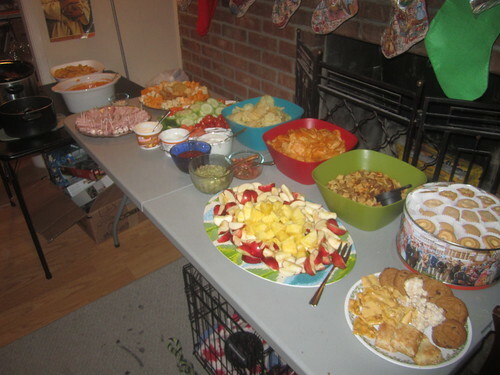 Here is our spread for the night... it's what's for dinner, folks. 2013 is nearly gone. 2014 is nearly here! In January, Michael baptized Samuel and Tom confirmed him. This is so awesome on so many levels. First, that Samuel was ready to be a member of the Church and make the choice to follow our Savior Jesus Christ in every way, including into the waters of baptism. Second, that Michael was a worthy Priesthood holder, that is, holding the same authority that the apostles received from Christ, to baptize his younger brother. Third, that my husband was able to perform the ordinance of giving the gift of the Holy Ghost to Samuel, through that same Priesthood power. 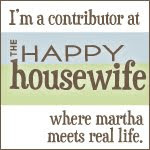 I think over the rest of the year I may have slightly forgotten how wonderfully it started. We also took a trip to Nauvoo (and Carthage) this year. It was over Easter weekend and we also got to see our Illinois family. It was neat to fully immerse ourselves in our Church history, as well as a good look at life in the early 1800s in our country. 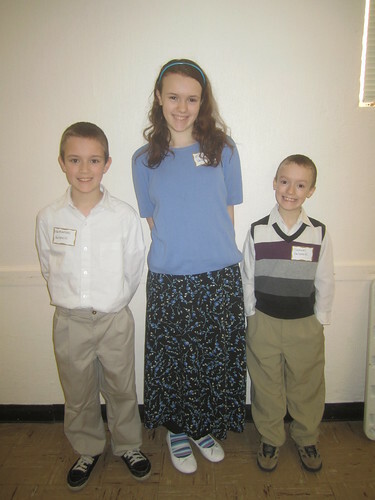 Testimonies of the Prophet Joseph Smith were strengthened, and we also just had a LOT of fun. It was also good seeing family and enjoying time with them, especially considering what happened in Washington, Illinois about 7 months later. We traveled to Utah as well this year, and got to see much of our western US family. We spent a week in Payson, Provo, Salt Lake City, hiking, visiting BYU (and getting shirts for EVERYONE! 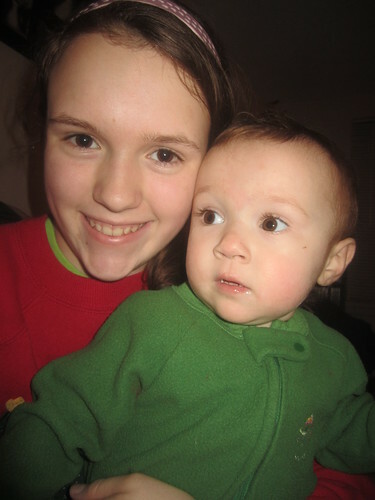 ), visiting friends, and playing with cousins. We were offered U of U shirts by a nice old guy. We saw Norman Rockwell's paintings of Scouts over the years. We made a lot of memories and got to see a LOT of temples, as well as a lot of Kansas driving there and back. Wait, no, it was dark through Kansas. We sat through a lot of traffic in Colorado instead. We saw Michael get his first job this year. He worked as a caricature artist at Worlds of Fun. It was neat seeing him earn money for his mission and college, as well as grow more independent and use his talents to make other people happy. Sometimes it was awkward working with two different work schedules but it works! Three children learned to read this year. 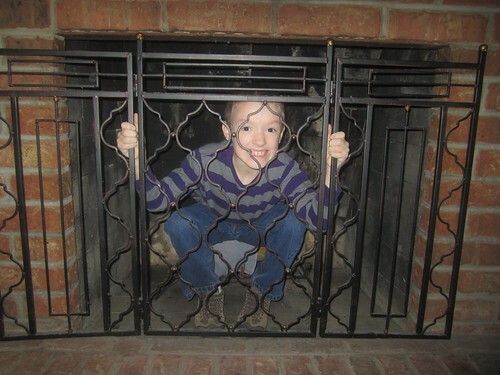 Even though they'd made a good start, Timothy and Christopher both had HUGE breakthroughs early in the year and Liberty had some major learning jumps late in the year. It's neat being able to read the scriptures together and only help with the hard words. 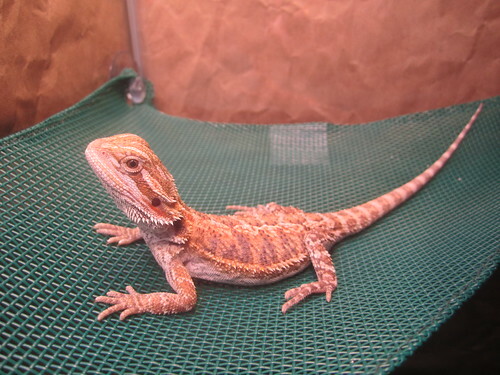 We got a bearded dragon this year. He belongs to Benjamin, but we all claim him. His name is Martin and he has doubled in size since October when we picked him up from Petco. It's fun to see him eat and grow and learn about all of us. Tom is Program Director for Cub Scout Day Camp. This means he is in charge of all the activities done at Day Camp for 700+ boys from ages 7 to 10. It takes over our lives for a short time in June and slightly before, but he preps starting in October. It's exciting but exhausting. We found out this year that we are expecting our 4th baby girl. 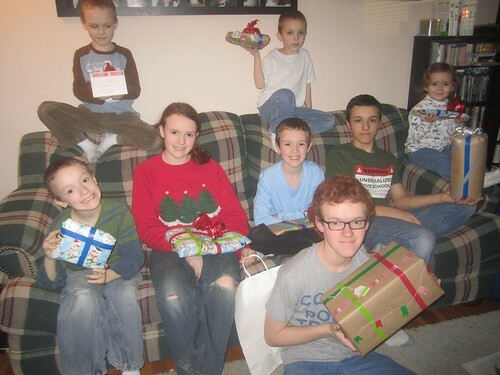 We knew when we started our family that we'd have mostly boys... we didn't expect to have more than one girl, honestly. Liberty was exciting... Juliana was shocking... I guess we don't have a word for this coming baby! Her name will most likely be Virginia. As a family we started watching the Doctor Who current series, mostly the modern series but we also watch the classics. The kids have really enjoyed all the different Doctors and shows. We have 4 Scouts (Cubs and Boys) and they all are doing well. 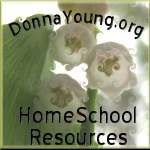 Samuel is a Wolf, Nathanael is a Webelos and working on Arrow of Light, Benjamin is now a Star, Michael is a Life and working on his Eagle required Merit Badges and thinking of a project..
Homeschooling is going well. 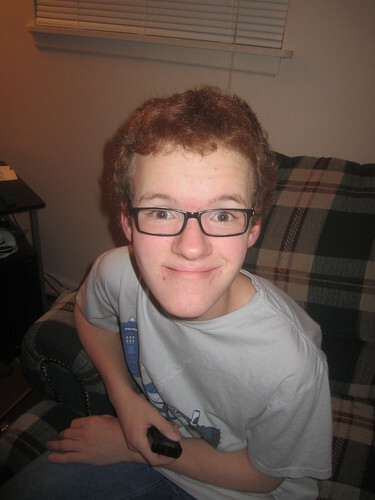 We have Michael graduating in the spring, Benjamin just started high school and seminary as a 9th grader. Emilie is somewhere in 7th or 8th grade. Right now it's all transition and none of us have decided where she is going to be next year. Nathanael is in 5th grade and Samuel is in 4th. All three of them did well in the Geography Bee last month. Timothy is in 1st grade and Christopher is in Kindergarten. Liberty is doing preschool and Jules is working on talking. Emilie is learning a lot and has recently started making all our bread, knitting a lot of new things, and baking something new each week. 2014 is going to be a great year too, so we can look forward or backward and really enjoy the view. IMG_2549, a photo by atvtnv on Flickr. 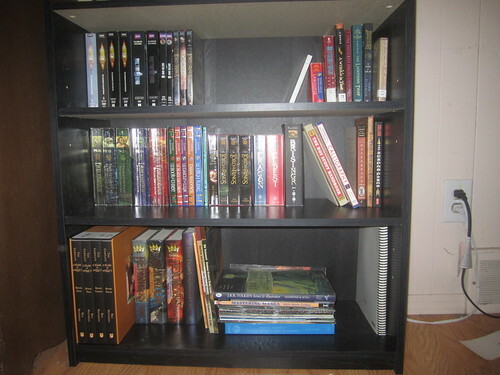 Michael's present from Santa, besides Legos, was a bookshelf. Finally put it together last night. Looks good! IMG_2546, a photo by atvtnv on Flickr. 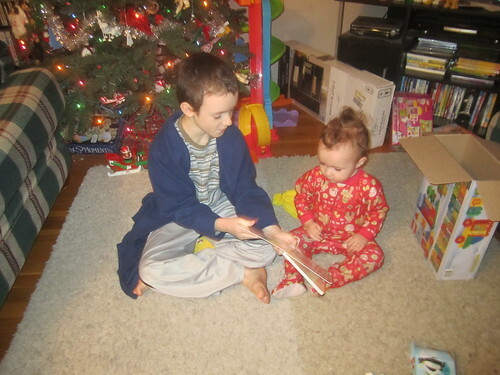 Samuel reading to Juliana. She knew some of the words and was helping. IMG_2547, a photo by atvtnv on Flickr. Tom and I went to the Hobbit: Desolation of Smaug tonight. We weren't able to go for my birthday due to ice and snow, but we made it a date for our anniversary instead. 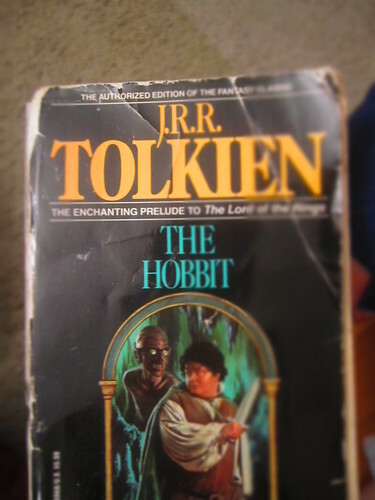 We loved the movie, even with the slight changes they made from the book. While they irked a bit, not enough to ruin a good movie experience. IMG_2513, a photo by atvtnv on Flickr. Juliana likes bows in her hair. 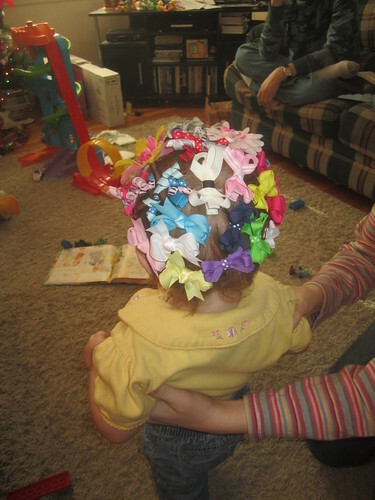 This was the end result of her bringing Emilie or me every bow she could find... does she really even have enough hair? IMG_2512, a photo by atvtnv on Flickr. Baby girl presents! She is loved, too. 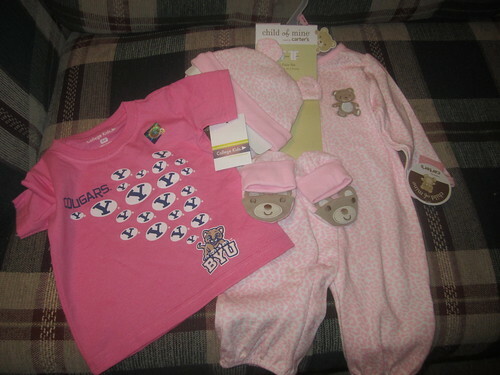 Tom is thrilled by the baby BYU shirt. 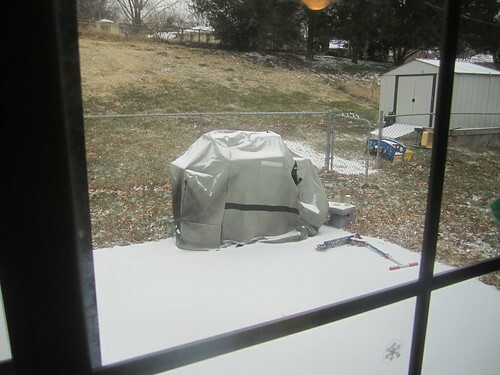 Now we're ALL covered, even in February when she arrives. Or January. Not December, though. I think. IMG_2420, a photo by atvtnv on Flickr. IMG_2414, a photo by atvtnv on Flickr. 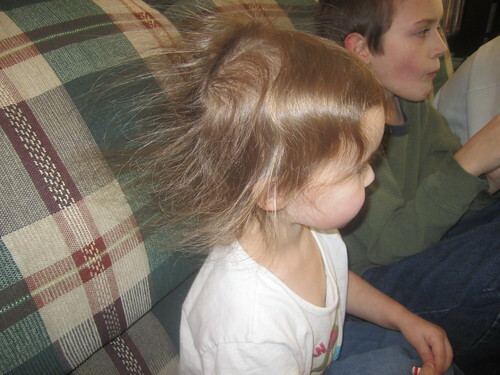 Static hair! Another dry winter day... even with all the snow. IMG_2396, a photo by atvtnv on Flickr. IMG_2394, a photo by atvtnv on Flickr. Snow and ice! 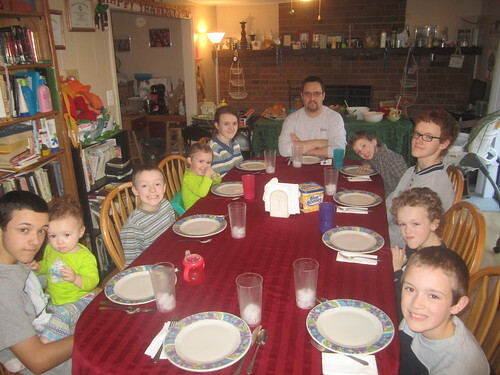 We mostly stayed in, other than Tom and the oldest boys going to church to help out. I had to stay home either way due to spotty baby girl. IMG_2390, a photo by atvtnv on Flickr. 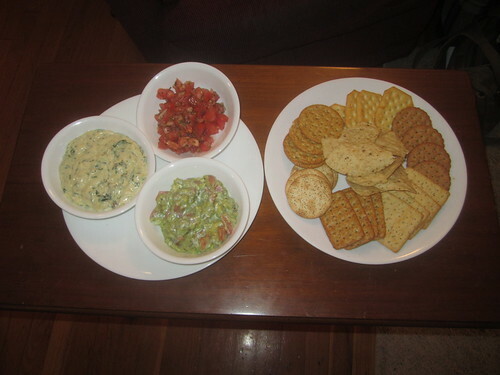 My favorite birthday gift... Tom made homemade dips for me. 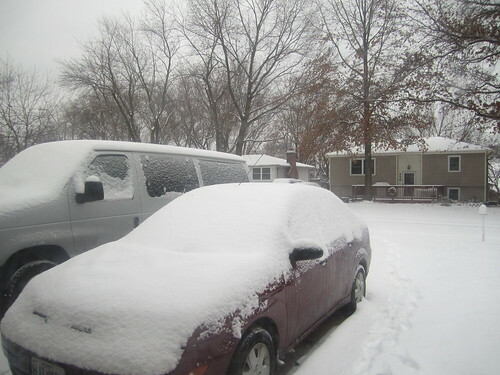 We ended up staying in due to weather (ice and snow) instead of going out for my birthday. Next best thing... date night in with Tom. IMG_2366, a photo by atvtnv on Flickr. 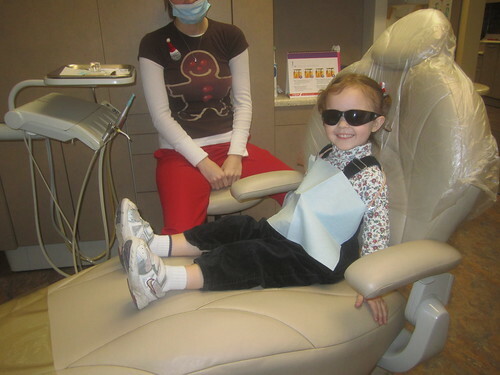 Liberty's first dentist appointment. She did great! IMG_2363, a photo by atvtnv on Flickr. 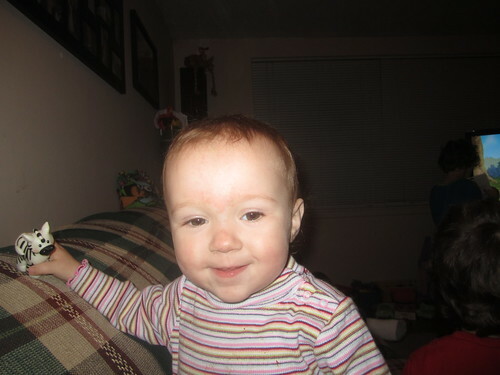 Still spotty from chicken pox but she is getting better! IMG_2353, a photo by atvtnv on Flickr. Christmas ornaments this year... Homemade. 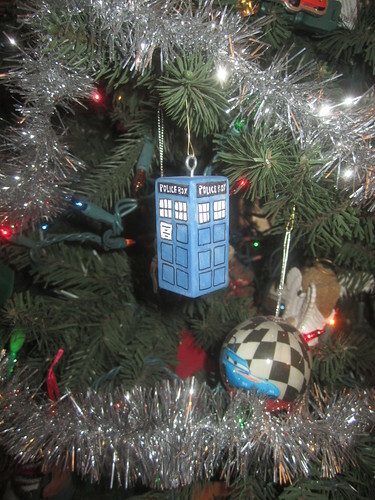 We'll have 13 surrounding our Christmas tree, just like the 50th anniversary special for Dr. Who... so baby girl gets one too, even though she's not here yet. IMG_2349, a photo by atvtnv on Flickr. IMG_2321, a photo by atvtnv on Flickr. Well, it's confirmed. 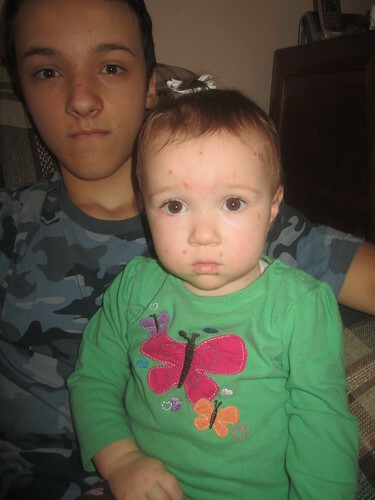 Baby girl has chicken pox. 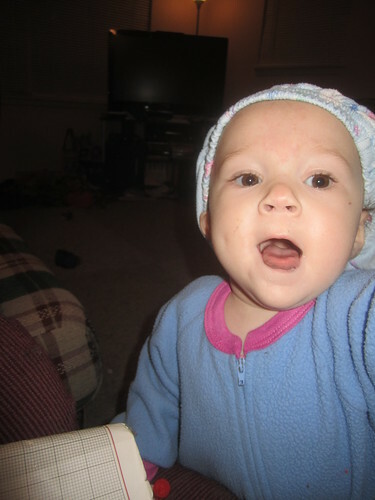 She caught it from Liberty getting her first vaccination for varicella on December 11th. (the vaccine is the live virus, so Liberty was contagious for a short amount of time.) She is doing great, other than looking awful. She is a happy camper. The fun part was letting everyone at church know (we thought the one spot she had was a bite...). Yikes! 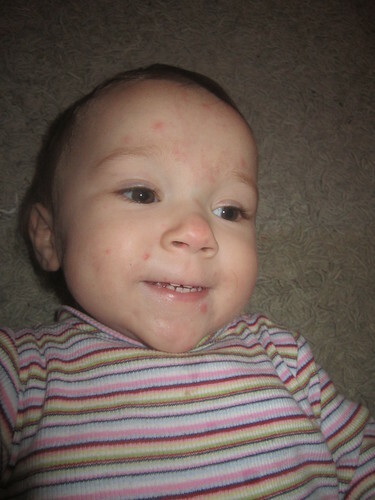 This is our first child with chicken pox, so other than our own experiences with the disease as a child, this was new! 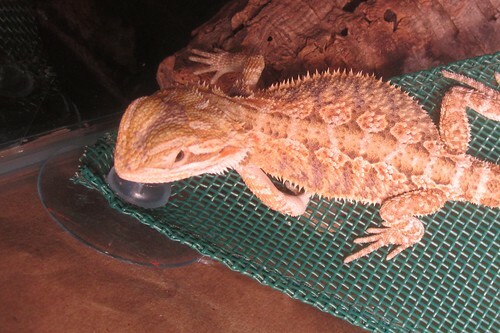 We just had to quarantine her, keep her comfy and watch everyone else for spots or signs of illness. You learn something all the time! IMG_2326, a photo by atvtnv on Flickr. One of my other favorite Nativities. Probably because it was hard to find! 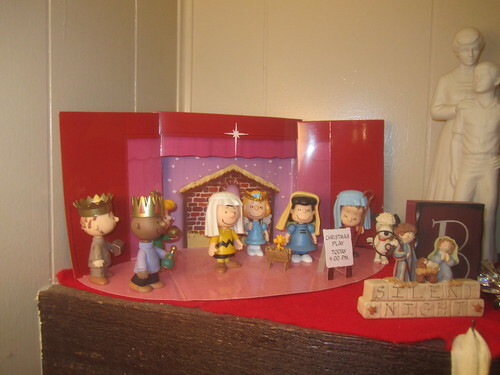 I love Snoopy, and I love nativities. This is perfect. IMG_2311, a photo by atvtnv on Flickr. 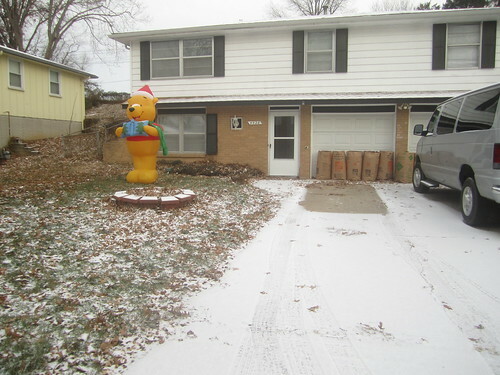 No, not a lot of snow and ice, but cold! 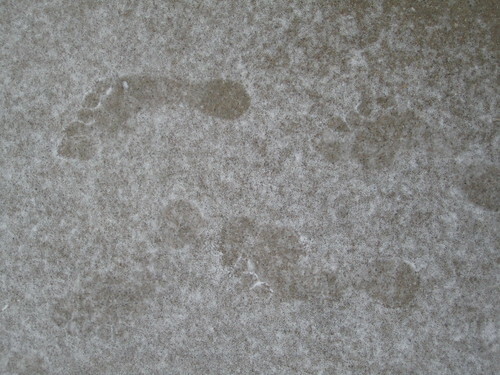 You can probably guess who put these footprints on the back porch. IMG_2309, a photo by atvtnv on Flickr. And he did great! 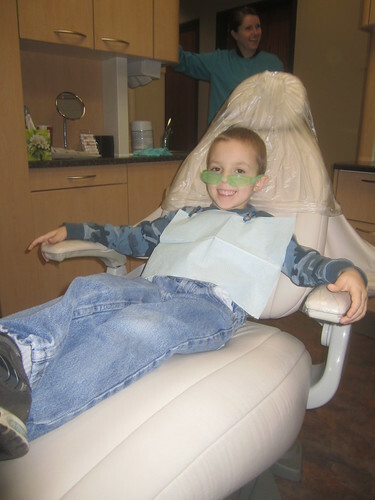 No cavities, they did x-rays, cleaning, the whole shebang and he did it all. IMG_2306, a photo by atvtnv on Flickr. IMG_2300, a photo by atvtnv on Flickr. 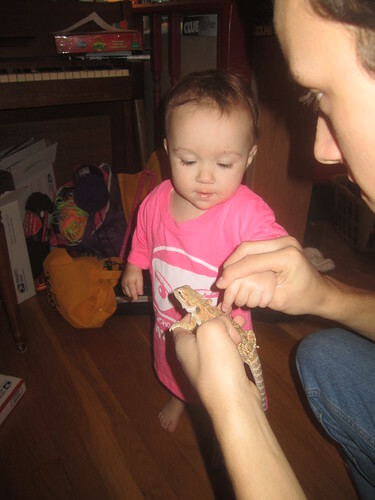 Juliana getting to pet the dragon, who she affectionately calls "ACK!" She IS learning new words, but this what she says when she sees Martin. IMG_2296, a photo by atvtnv on Flickr. This is Emilie's snail. He lives in our fish tank. 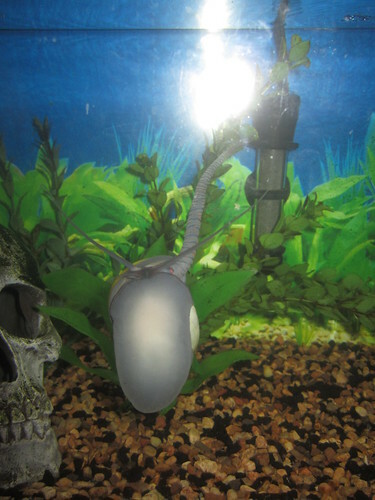 This is a weird phenomenon as he sticks out a long siphon to breathe air (he also has gills. 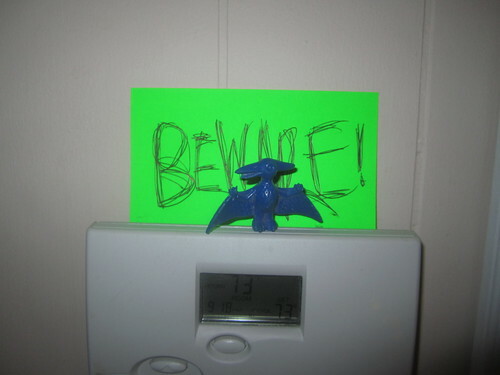 Benjamin caught it with the camera, as he has the zoo in his room. IMG_2281, a photo by atvtnv on Flickr. 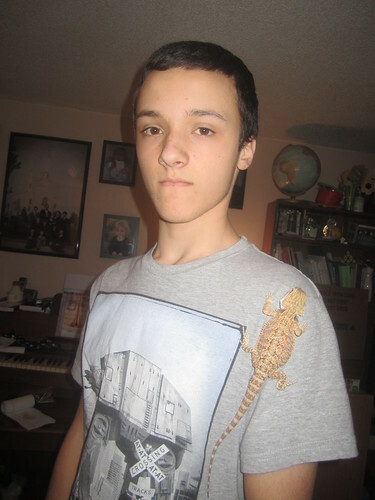 Benjamin has Martin on his shirt... this is a learning process for his dragon, too, making sure he's comfortable riding around and also getting used to seeing everyone. IMG_2265, a photo by atvtnv on Flickr. Second snow of the year... more like an inch... still dry and powdery. Roads a bit slicker... still not sticking to the grass! julespraying, a photo by atvtnv on Flickr. Juliana all ready for family prayer. 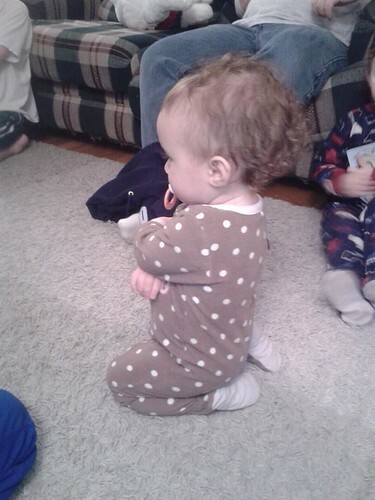 She's learned how to kneel this week. She already knew how to fold her arms. Big girl! IMG_2263, a photo by atvtnv on Flickr. 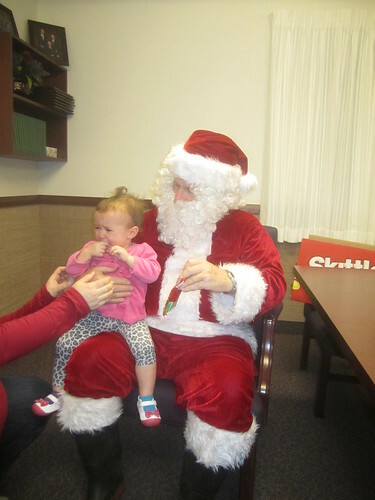 First experience with Santa... she was absolutely fine until she got close. She really wanted the Skittles he was handing out. IMG_2231, a photo by atvtnv on Flickr. First snow of the year... dry powdery dusting of the roads and such. Nothing to measure, really. IMG_2230, a photo by atvtnv on Flickr. Something is wrong with this picture. 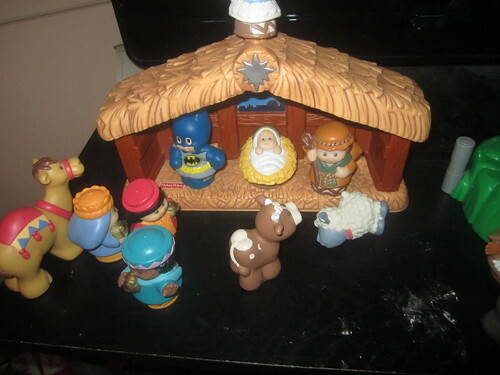 This is my favorite Nativity :) Just thought the addition (substitution?) was humorous. IMG_2215, a photo by atvtnv on Flickr. Last warm day of the year (it was in the 60s) before a really cold snap. 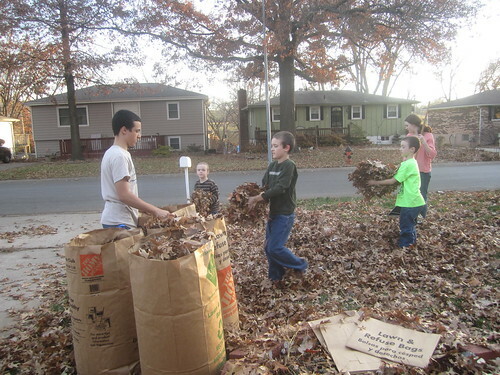 We decided to get all the leaves gathered up (that our neighbors' trees share with us...we have no trees.) and bagged. The kids did most of it! IMG_2209, a photo by atvtnv on Flickr. 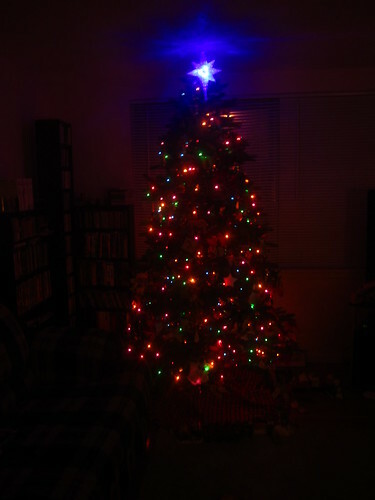 Our tree is up! 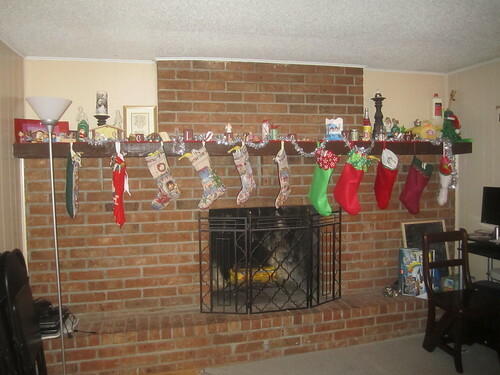 Just needs tinsel... and this year's ornaments. We're working on that. IMG_2198, a photo by atvtnv on Flickr. 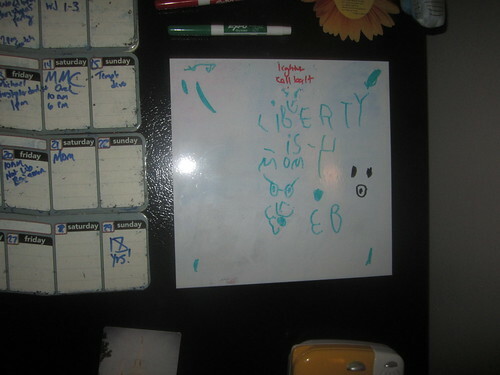 Liberty wrote on the fridge today... "Liberty is 4. Mom 38." I'm proud of her writing... but I wonder when she did this, lol. IMG_2195, a photo by atvtnv on Flickr. 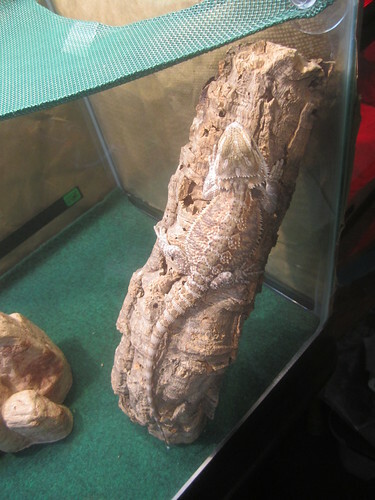 Can you find the Bearded Dragon? IMG_2192, a photo by atvtnv on Flickr. 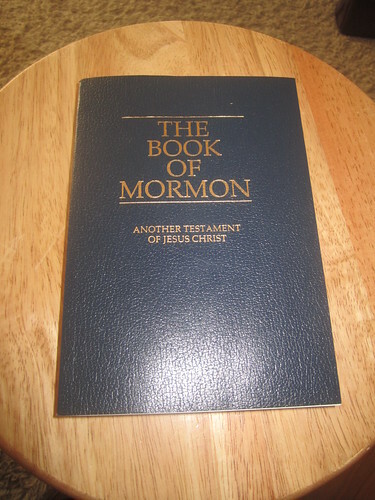 Today the missionaries were encouraging us to share the Book of Mormon. This book is true. It is the best book I've ever read, as far as books to encourage, uplift, bless, teach, and learn about things that are truly important and eternal. It stands alongside the Bible to testify of Jesus Christ, our Savior, and was sent by God to bless us, because He loves us. I encourage anyone to read it. You will be better because of it. I love you all! IMG_2187, a photo by atvtnv on Flickr. Here are ten of the best people I know... and I am thankful for all of them! Happy Thanksgiving, everyone! IMG_2160, a photo by atvtnv on Flickr. 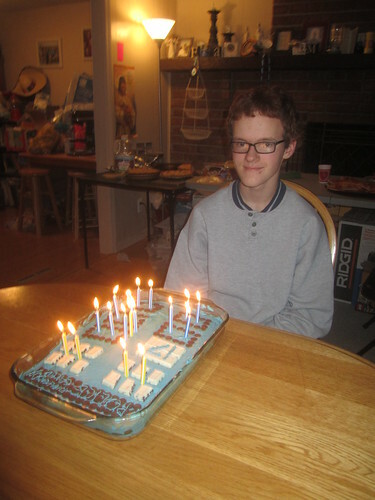 Happy 17th birthday to our Michael! He is a great addition to our family (the first!) and I can't believe he only has one more year before he *could* go on a mission, college, both... wow! IMG_2128, a photo by atvtnv on Flickr. IMG_2122, a photo by atvtnv on Flickr. And the amazing Martin. He's getting really big really fast! It's been fun to watch him grow. IMG_2112, a photo by atvtnv on Flickr. New hairdo for church! 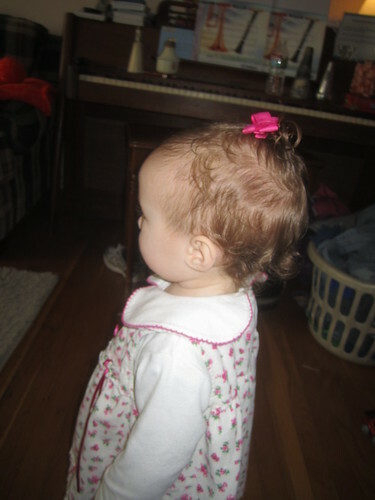 Jules' curly hair is now long enough for a tiny little pigtail. IMG_2100, a photo by atvtnv on Flickr. Michael is being surprisingly intent on the camera-holder... very very attentive. Hello, Michael. IMG_2080, a photo by atvtnv on Flickr. Emilie and Jules... sisters... though Juliana is trying to figure out what Em is doing. IMG_2078, a photo by atvtnv on Flickr. It's great what you can do when you are a big girl (19 months old), including putting your sister's pajama bottoms on your head! 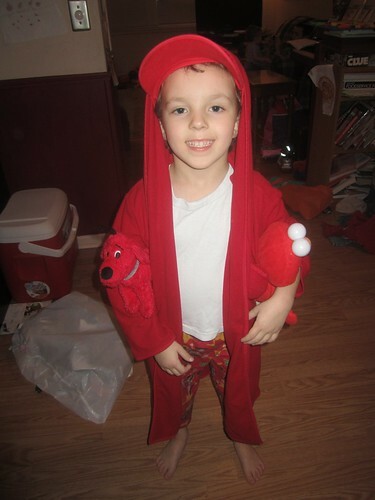 Christopher is "Red Man". He was so excited to be so themed that we HAD to take a picture. IMG_2023, a photo by atvtnv on Flickr. 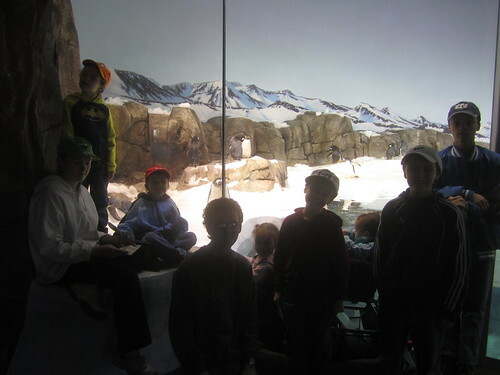 The kids at the new penguin exhibit at the zoo. It was so nice today, and, even though I am 29 week pregnant with child #11, I still was able to ramble around the zoo with my children. It was a good day! IMG_2001, a photo by atvtnv on Flickr. Geography Bee! These three have worked so hard to get ready. One finished in the lowest 5, one at 7th and one at 5th, out of 20 students. They did GREAT and we are proud of all three! IMG_1999, a photo by atvtnv on Flickr. IMG_1996, a photo by atvtnv on Flickr. Emilie knitting... loom knitting, but improving all the time. Eventually she'll want to expand her skills, but she can do so much with those looms! 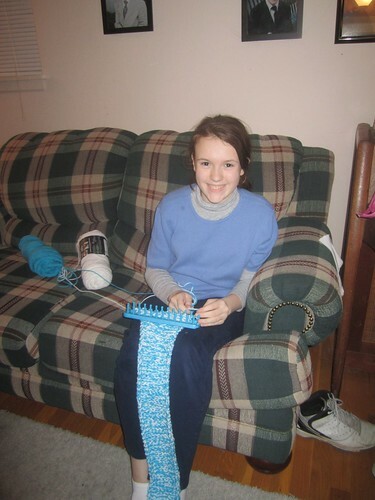 She saved babysitting money to buy some different looms so she could make a larger variety of items. IMG_1994 - Copy, a photo by atvtnv on Flickr. 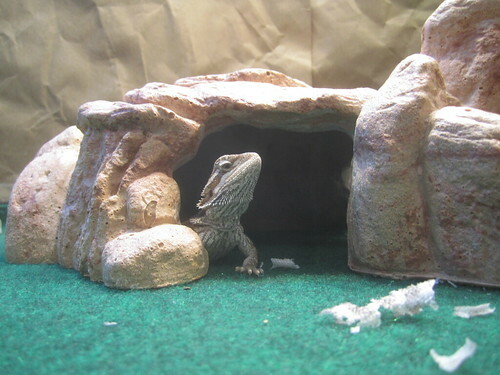 Benjamin's taken over the camera a lot this week to get pictures of his bearded dragon Martin. It's amazing how much this little guy has grown. This is after his second shedding... and he's nearly 3 inches longer than when we got him a month ago! IMG_1990, a photo by atvtnv on Flickr. 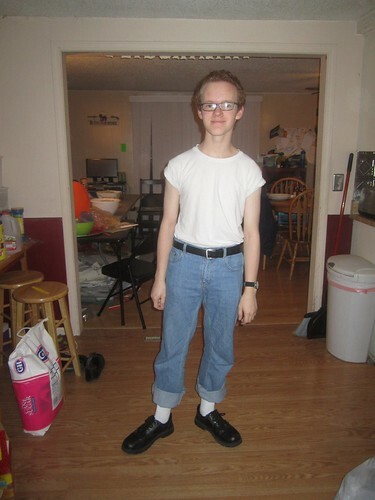 Going for 50's look here... he had to dress up as some other period of time for his meeting tonight, even though plans changed later. IMG_1983, a photo by atvtnv on Flickr. 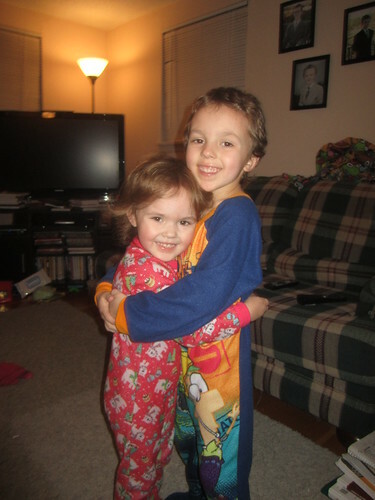 Liberty and Christopher, footy pajama buddies. 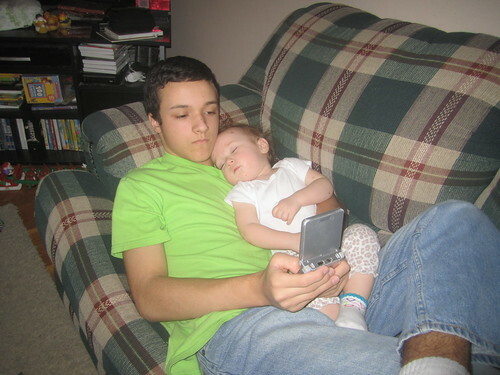 Blackmail picture for 10 years from now. They do get along most of the time... but when they don't, it's not fun. IMG_1980, a photo by atvtnv on Flickr.